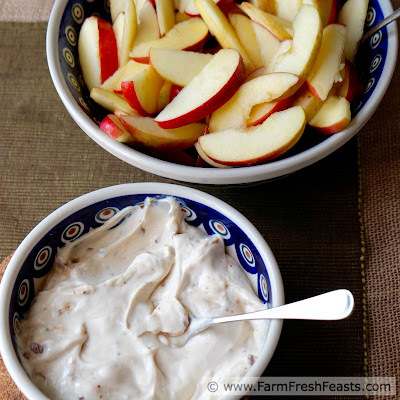 A fruit dip made from cream cheese, yogurt, brown sugar and the crunch of milk chocolate toffee bits. This is great for parties or special afternoon snacks and appeals to all ages. Apples have been appearing at my local farmer's market. I buy a handful, take them home, slice them up and we eat them. [The rest of the household would eat the core and everything, but someone around here needs to have standards.] 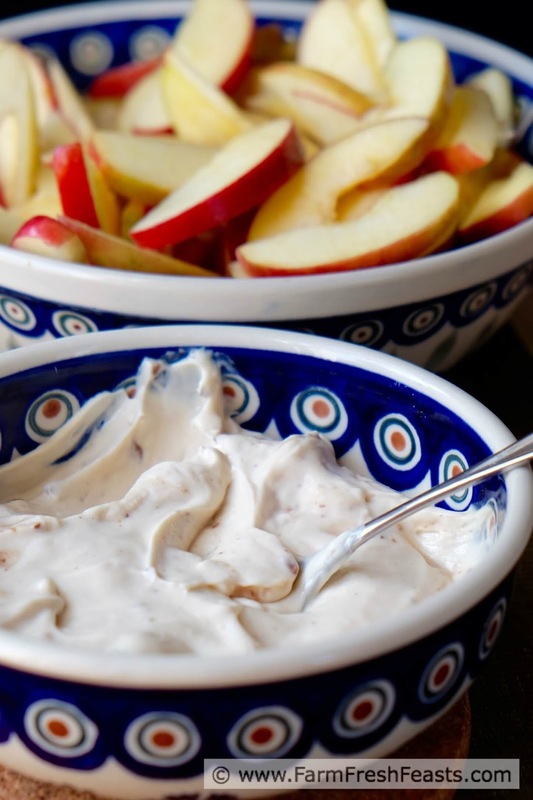 Local apples** are bred for flavor, not ability to look pretty for 6 months, so it seems kinda silly to share a dip recipe to eat with such tasty apples as a Buckeye Gala. This is not gilding a lily, though--my Caramel Apple Toffee Parfait with Cream Cheese Ice Cream? Total lily-gilding, that one. 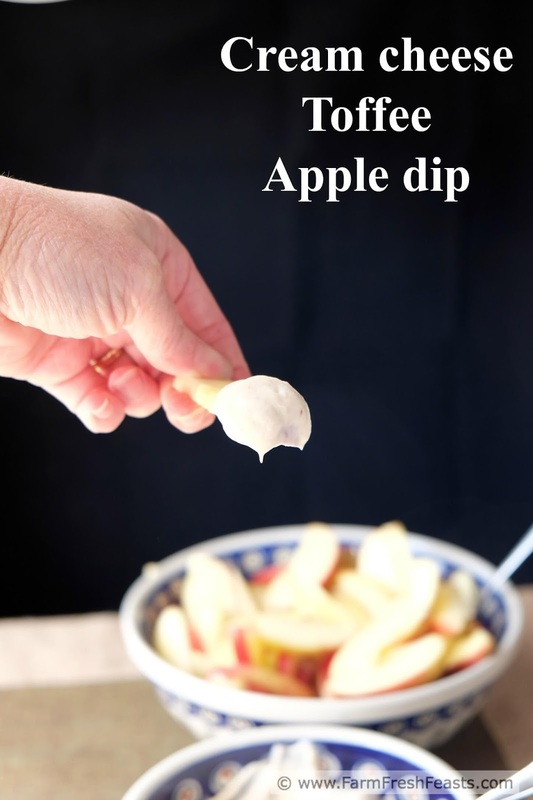 This is just a simple dip to have on hand if you want to dress up a fruit snack or have something special to go alongside a healthy snack at an event. You gotta have a couple of good dips in your repertoire. Dips that you can make practically with your eyes closed using common pantry and refrigerator staples. Dips that fit a variety of occasions and please folks of all ages. This is one of those dips. [My Spiced Cottage Cheese Potato Chip Dip is another.] When I searched my sent emails folder to confirm the recipe I realized I've been emailing folks this recipe for more than 10 years. 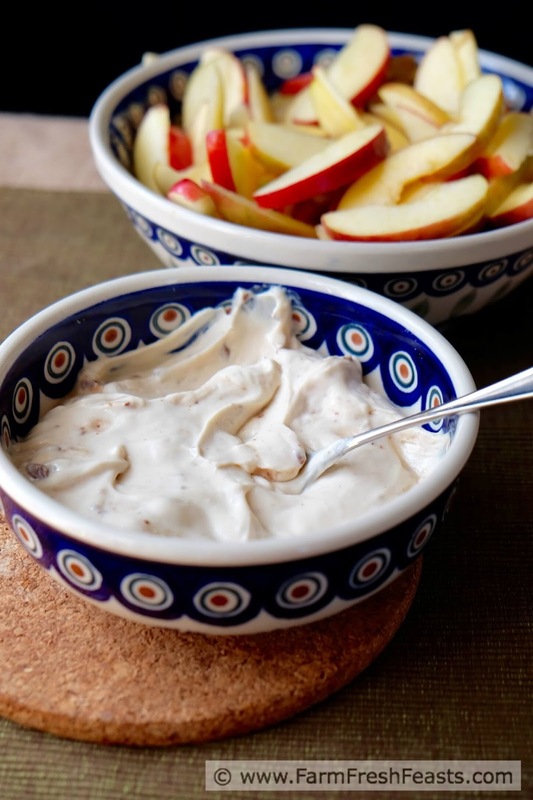 It evolved out of an amaretto fruit dip I'd had at the same church basement wedding reception where I learned the pineapple juice hack for keeping apples from turning brown. 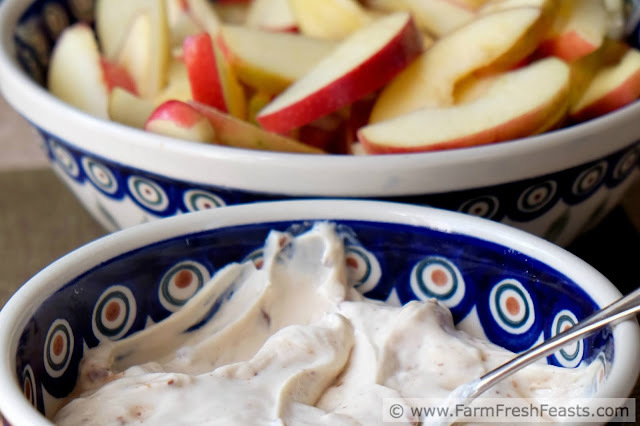 I don't usually have amaretto on hand, so when I tried a Cool Whip-based fruit dip using Heath bar bits I knew that would go great instead of amaretto. Note: I don't usually recommend brands of food on this blog, I'm more into the local produce, but I do make exceptions. This dip tastes best with Heath bar bits, the milk chocolate-covered toffee bits. The bag has an orange banner--like this Amazon affiliate link shows [but don't buy it from Amazon--sheesh you can find it for ⅓ the price in a grocery store]. Each time I move, as I am settling into our new neighborhood, I check the chocolate chip aisle of the local grocery stores. Most will carry only the plain Bits o' Brickle variety with a blue banner as shown in this outrageously expensive Amazon affiliate link but keep looking until you source the milk chocolate variety then buy a couple of bags for the pantry stash. They are good in cookies, too, like my Toffee Pecan Chocolate Chip Cookies. For other recipes using apples, please see my Apple Recipes Collection, part of the Visual Recipe Index by Ingredient, a resource for folks like me eating from the farm share, the farmer's market, and generous neighbors with apple trees. I've got more appetizers on my Awesome Veggie Apps and Snacks board on Pinterest, and more fruit from around the web on my Fruit board. Want to know how to use this blog? Click here. Using a hand mixer, stand mixer, or a crazy strong forearm and a steel whisk, beat the cream cheese until fluffy. Stir in the brown sugar, yogurt, vanilla and Heath bar bits. Chill for 30 minutes to 8 hours. This keeps for a few days, though you may notice the chocolate liquifying a bit--just stir it in. Slice the apples and toss them with pineapple juice. What proportion? Well, I've never used more than a single 6 oz can of pineapple juice and I've cut up a 3 pound bag of apples, so I know up to that ratio works fine. As long as the cut surfaces of apple have come into brief contact with the pineapple juice, the apples will not turn brown for several days. If you leave them in the pineapple juice for several days, the slices on the bottom immersed in the juice will get mushy, but if you toss them a few times a day they stay crisp. Oh--don't forget to serve them together. **My very first CSA, Bull Run Mountain Farm, had a fruit share. That year I ate the best apples of my life, apples that I've been searching for ever since. The variety was called Larry, from the Shenandoah valley. Damn fine apples. Yet another bonus of eating locally--food that tastes amazing. I adore health toffee bits. It's always been a favorite of mine. Also, I'm pretty sure we could classify the strong forearm whisking as exercise, especially when you factor in carrying the apples home from the store. Typically the spouse holds the dogs while I shop at the farmer's market and then carries my bag home, but when I am on my own I manage. I ain't whisking no cream cheese though. I have too many appliances that can handle that task for me while I walk dogs and fetch groceries. Be still my soul ... Heath bar heaven. Great way to get caramel flavor without making caramel! I think I'd need a candy thermometer to make caramel. Don't I? Clearly I've never made it. However, I did make my first pie crusts from scratch over the weekend (made pasties for my honey) so I won't say I'll never make caramel.